Nearly 300 people filled the Carver Theater on Monday, March 11 for a conversation about the century-old tradition of the Zulu Social Aid and Pleasure Club’s members and riders painting their faces black to ride on Mardi Gras Day. The New Orleans Black-Owned Media Collaborative, an organization in which The New Orleans Tribune isholds membership, sponsored the event. If there is anything about this debate that has been positive, we think it is the role of the local Black press in providing a platform and creating opportunities for “our” community to discuss an issue important to it. Unfortunately, with official members of the Zulu Social Aid and Pleasure Club deciding not to participate in the event at the last minute despite earlier confirmation, the forum was not as balanced as we would have liked. Still, rest assured that this is not the last time that the Black-owned Media Collaborative will work to bring members of our community together for solutions-oriented dialogue around other issues that affect us. There is so much good work that can and must be done with regard to bringing our community together to call for action on the issues that impact it. As for The New Orleans Tribune, we will admit to being somewhat torn over this issue of Zulu’s black paint practice. It’s not that we are unclear regarding our own position. It’s just that there are layers to this thing. Still, before going any further, we will share our stance and attempt to peel off some of those layers. As members of the Black-owned Media Collaborative we stood united with the organization in hosting this forum because we take seriously our role as a voice to and for the community and because we believe there is strength in this collective of small, Black-owned media outlets working together. Still, at The Tribune, we’ve been hesitant to spend time debating whether what Zulu does is even blackface and, if it is, whether its members should continue to do it. In our opinion, the debate is diversionary and distracting. Folks have already spent weeks arguing over something that took place on one day, and won’t take place again until one day next year. We have said it before; but it seems to bear repeating. We have 99 problems; and as far as we are concerned, blackface is not one. 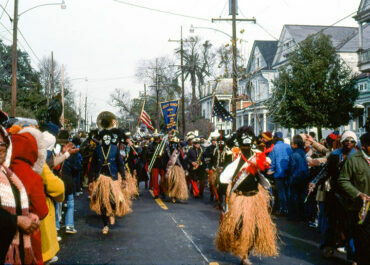 Neither is the practice of Zulu’s members and riders painting their faces black for Mardi Gras. That does not mean we don’t understand the hurtful, harmful history behind blackface. We do. That does not mean we think blackface is acceptable. We don’t. We simply submit that, as a community, we have far more important issues—concrete matters that evidence their impact on the lives of people in our community every day—on which to focus our time and attention. Hold on, before anyone goes in, we are not suggesting that Black New Orleans must make an either/or decision when it comes to choosing causes it will champion or injustices it will challenge. Yes, we can do it all. Come one, let’s tell the truth and shame the devil. Besides Mardi Gras Day at Orleans and Claiborne, Super Sunday or second lines on any given Sunday across the city, or some other celebratory event, when was the last time you can recall 300 New Orleanians—mostly Black—gathering to discuss, debate, protest and maybe even come to some consensus on an obviously important issue. So yes, we are troubled by the fact that the ability to build such momentum and stir passions is exhausted on an issue that does little to push the pendulum on institutional racism and its effects on Black people in New Orleans. As most of our readers have noticed, we, at The Tribune, are especially troubled about the travesty of injustices surrounding the hijacking of public education by profiteers. It an issue we have written about incessantly for the past 12 years, and we can recall protests waged by students against what has taken place at schools under the control of the Recovery School District several years ago. In 2012, Walter S. Cohen students took their fight right to the front door of the Recovery School District in New Orleans. Around the same time, students, parents and alumni at the former John McDonogh High School also took to the street to protest the takeover and poor management of their campus by a charter operator. To read media accounts of these actions, one must turn to The Louisiana Weekly, The Tribune and The Lens as the mainstream media all but ignored these demonstrations. Not only were these protests largely ignored by the mainstream media, but we are hard-pressed to recall a real outpouring of community support for these students and the issues they faced. These students were lucky if 30 members of the community showed up to bolster their efforts. But almost 300 folk show up to argue over blackface. And both mainstream daily newspapers were at the Carver to dissect Zulu’s alleged use of blackface. The Zulu Social Aid & Pleasure Club’s black paint did not cause our 44 percent unemployment rate among working age Black men. It did not create the disaster in our schools. It is not why a disproportionate number of members of our community are housing cost burdened or live in poverty or fill jail cells. Zulu could announce that it will end the practice of its members and riders painting their faces Black today, and none of that will change. So given the choice between challenging symbols of racial oppression and actual racial oppression, we will choose to take on the actual oppression. We can appreciate the role that Take ‘Em Down NOLA has played in the community. They were at the forefront of the push to remove Confederate-era monuments. They were right when they claimed those monuments had no place in the public landscape. And while we took issue with the time, effort, money and attention given to razing these monuments, we are glad they are gone. A part of the reason we were actually happy those statues came down was because we hoped their removal meant that the energy and resources poured into their razing could be placed elsewhere. Quite frankly, Zulu’s black paint was not the “elsewhere” we imagined. While it is true that Zulu’s practice of painting faces black has been at the center of controversy before, we are concerned about how and why this debate has resurfaced in our community at this time. As we understand it, for two years in the mid sixties during the height of the Civil Rights movement and amid the growing Black power and Black pride movements of the times, Zulu members removed their black paint. But after a couple years, Zulu members began painting their faces black again. Sure, there are the anecdotal stories of individuals expressing consternation or confusion over the practice. But for the last 40 plus years, Zulu members have been riding and marching in black paint on Mardi Gras Day without little or no commotion, upheaval or to-do. In fact, it seems that Zulu’s black paint did not become an issue again until news of the medical school year book photo of Virginia Gov. Ralph Northam in blackface surfaced. Northam’s photo followed by Gucci and Prada’s blackface debacles created a firestorm surrounding the legacy of blackface as a remnant of white supremacy. Filled with conflict, stories about blackface inundated mainstream media. Press conferences were held. Lots of apologies were made. There were even pre-emptive admissions on the part of White men now in positions of leadership afraid that a blackface photo from their pasts would soon haunt them as well. Diversity councils were created. National and local news directors and assignment editors couldn’t get enough of blackface. Discourse and media coverage are fine, but allowing a 40-year-old yearbook photo or the designs of overpriced clothing to dictate our agenda is another thing all together. There is a reason this debate is important and personal for many. Zulu means a lot to the people of New Orleans—especially Black people. There was a time when carnival was just as segregated as the rest of the city and the Deep South. To be clear, there was time when this city’s premier celebration completely excluded its citizens of color, a time when Black people—enslaved or free—could not take part in the spectacle known as Mardi Gras. A time when they could not parade down the city’s streets or even gather for too long. By the turn of the 20th century, Zulu changed that. 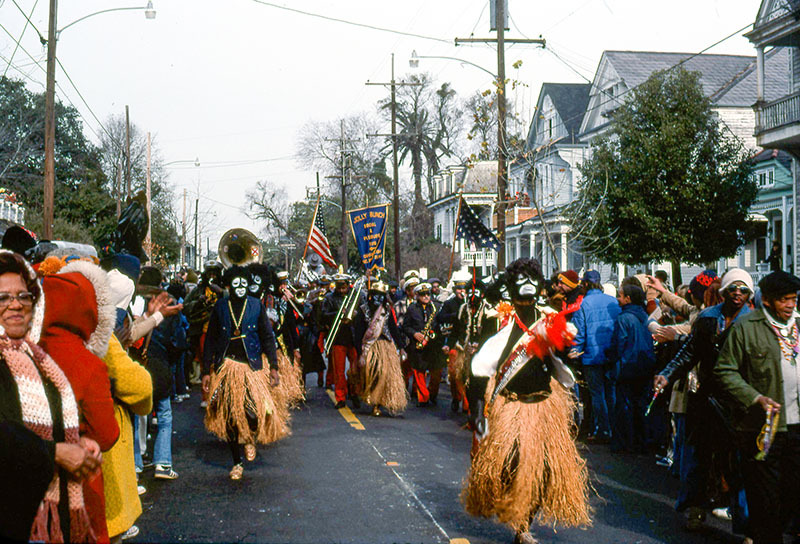 Today, along with Skull & Bones, Black Indian tribes and other largely Black social aid and marching groups, Zulu IS Mardi Gras Day for many Black New Orleanians. Unlike any other Carnival krewe that parades on Mardi Gras Day, it is the only one that does not end its route in the CBD, instead turning left on Canal Street to Basin where it makes a right and continues down Orleans Avenue and then to North Broad—marching through one of the city’s historically Black neighborhoods. New Orleans’ Carnival krewes have only been desegregated for 27 years—an effort that was championed by the late Dorothy Mae Taylor while she served on the New Orleans City Council. Even in the wake of this ordinance, “desegregated” has really only meant that just a very few, handpicked, well-vetted African-Americans have been chosen for membership in some of the city’s oldest and whitest Carnival organizations. Oddly enough, Zulu, whose members include men from all walks of life, is likely the city’s most intgregated krewe today, opening its doors to members of other races long before the City Council ordinance forcing krewes to do so. In short, Zulu has led the way and been an example for all of New Orleans. More than any of that, the Zulu Social Aid & Pleasure Club is a jewel in the community—a venerable organization that does its share of good. As pointed out by David Belfield, who, when asked, courageously stepped in to speak in favor of black paint tradition at the forum although he is no longer a member of the organization, the Zulu Social Aid & Pleasure Club does its share of community service throughout the year—from awarding college scholarships, to food give-a-ways at Thanksgiving to toy drives at Christmas. Like many other organizations, Zulu gives back. And yes, it is true that they could do all of those admirable things without painting their faces black on Mardi Gras Day. We fully respect that position as much as we appreciate the role the Zulu organization has played throughout our community for 110 years. Jim Crow, segregation, and slavery, too, were long-time traditions that were only bolstered by laws. In the South, especially, it was tradition of White racists to call a Black man “boy” no matter how old he was. Traditionally, Black women—if they worked outside the home—were relegated to being domestics or, if they were lucky teachers or nurses—but certainly not mayor. And if tradition had as much power as we would like to give it, Barack Obama would have never made history as our nation’s first Black president. Don’t misconstrue our message. For full disclosure, we do not buy into the argument that what Zulu does is actually blackface at all. And understanding the organization’s history, we don’t think it ever was or is today done to malign, mock or ridicule their own people or to pay homage to the legacy of minstrel show blackface. And today—perhaps more than ever—it is, as its leaders and members have suggested, done as a part of a day of fun and revelry. But, as the saying goes intent follows the bullet. Yes, this is one of those layers we mentioned earlier. In other words, just because there is a lack of intent does not automatically mean there is a lack of impact. Just because Zulu’s members do not mean to offend does not mean they are not offending some. Those who are aggrieved by Zulu’s black paint tradition have every right to feel what ever they feel. Still, Zulu, a private organization, has every right to continue with its tradition. But if “tradition” is the best reason for continuing the practice, then we also believe that reexamining the relevance and consequence of that tradition is never a bad idea. Nonetheless, that is a decision for Zulu. And while they do that, we will focus our time, attention and resources on other concerns. And we urge, our loyal readers, to join us in doing so. We refuse to concede that real progress and freedom for Black New Orleanians is tied to whether or not Zulus paint their faces black on Mardi Gras Day. And we are certain that conflict and fighting amongst Black people over blackface or black-painted faces, while they might make great headlines and provide fodder for The Advocate and nola.com, have been the biggest impediments to our progress and freedom that we have seen recently.